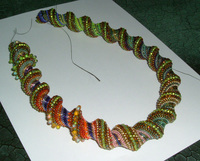 This is a spiral necklace which I adapted from a very beautiful book "The Art & Elegance of Beadweaving: New Jewelry Designs with Classic Stitches" by Carol Wilcox Wells. The back cover has a primary coloured bracelet which is what got me going. I didn't want a bracelet, so a necklace seemed the next best thing. The problem for me (because this is only the 2nd beading project that I have attempted) was how to finish it. The answer came in another book on making beaded beads: "Beadwork Creates Beaded Beads" by Jean Campbell, published by Interweave Press. Voila - it was exactly what I was looking for. 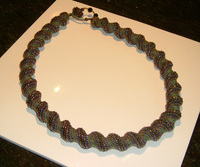 The only problem I ran into is that I listened to an "expert" in the beadstore where I purchased the beads for the first necklace. He recommended I use "c" or "b" thread to make the necklace. NOT STRONG ENOUGH!!!! Unfortunately, I didn't know this until the piece was completed and it was too late to change it. Now it can be displayed, but sadly not worn.